Diabetic muscle infarction (DMI) is one of the microvascular complications seen in patients with longstanding diabetes. It is also referred to as aseptic myonecrosis, diabetic myonecrosis, and tumoriform focal muscular degeneration., It should be considered in any diabetic who presents with acute painful swelling of limbs. It is seen in patients with poorly controlled diabetes and in association with other microvascular complications such as retinopathy and nephropathy., It is said that 70% of patients with DMI have accompanying kidney disease. But it is reported rarely in dialysis patients probably because of under diagnosis or misdiagnosis. Here we report two cases of DMI that were seen in dialysis patients over last 3 years in our institution. A 35-year-old diabetic male with chronic kidney disease (CKD) stage 5 due to biopsy-proven immunoglobulin A nephropathy and on hemodialysis thrice weekly since 14 months presented with acute onset pain of calf muscle in right lower limb, immediately after dialysis session. It was presumed to be muscle fiber tear secondary to intense muscle cramps and he was treated with analgesics. Pain worsened over the week, with patient experiencing severe pain while walking. Ultrasound examination revealed intense muscle edema. No area of liquefaction suggestive of abscess was seen. He had poor glycemic control, with glycosylated hemoglobin being 8.6%. He had hemoglobin of 9.7 g/dl; total leucocyte count (TLC) of 8790 cells/mm3, with polymorphonuclear neutrophils constituting 70%. Serum creatinine was 11.5 mg/dl, serum creatine phosphokinase (CPK) was 365 units/liter (normal reference range 24–175 units/liter), and calcium, phosphorus, and albumin were within normal limits. 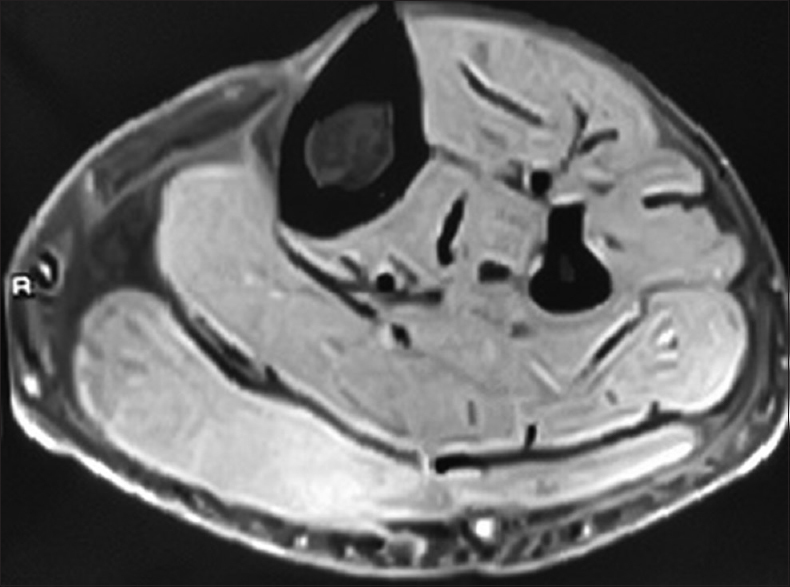 Magnetic resonance imaging (MRI) of the involved limb showed hyperintense signal in the upper gastrocnemius muscle on T2-weighted images [Figure 1]. He was treated with analgesics and antiplatelet agents, clopidogrel 75 mg with aspirin 150 mg/day. Three days later patient had relief of symptoms and he was able to walk without a limp for the first time since the pain started. The muscles became supple and gradually over the next 2 weeks, the pain disappeared. There was no recurrence over the ensuing period of nearly 26 months. A 58-year-old gentleman with diabetes and CKD stage 5 on continuous ambulatory peritoneal dialysis (CAPD) presented with severe pain in the right thigh of 2-day duration. He was on CAPD since 3 years, and was performing four exchanges per day with three exchanges being that of 2.5% glucose and one nocturnal exchange of icodextrin fluid. His glycosylated hemoglobin was 9.7%, with mean blood glucose of 256 mg%. Hemoglobin was 10.6 g/dl with TLC of 9460 cells/mm3. Serum CPK was 312 IU/ml, serum creatinine, calcium, phosphorus, and albumin were 11.2, 8.9, 4.5, all in mg/dl and 3.5 g/dl, respectively. There was severe tenderness over anteromedial aspect of right thigh. There were no erythematous changes of the overlying skin. MRI of the affected thigh revealed diffuse T2/STIR hyperintensity involving vastus medialis and vastus intermedius muscles with focal T1 hyperintensity, likely due to hemorrhagic infarction. Diffuse subcutaneous edema was also seen [Figure 2]. He was treated with nonsteroidal anti-inflammatory drugs and antiplatelet agents, clopidogrel 75 mg with aspirin 75 mg/day. He responded with relief of pain of almost 60% within one week, with reduction of limb swelling and tenderness. DMI is an under-recognized and infrequently reported microvascular complication seen in longstanding and poorly controlled diabetes mellitus. It has been described in both type 1 and type 2 diabetes and is seen in association with other microvascular complications, namely retinopathy and nephropathy. Patients present typically with acute atraumatic painful limb swelling localized to certain muscle groups., Quadriceps and gastrocnemius are the muscles commonly involved, although there are few rare reports of upper limb involvement. Bilateral involvement may also occur rarely. Laboratory investigations are nonspecific and generally show high erythrocyte sedimentation rate, normal white cell count, and normal or mild elevation of CPK. MRI is the diagnostic modality of choice.,, MRI findings are invariably characterized by increased signal intensity of the diffusely enlarged muscle groups on T2-weighted sequences.,, Localization of the signal within a single muscle or muscle group with adjacent perifascial fluid is highly suggestive. Muscles appear hypointense or isointense on T1-weighted images. There can be hemorrhage in the affected muscle groups, when it may appear hyperintense in T1-weighted images, which may be patchy. Computed tomography scan and sonographic examination also reveal edema of affected muscles. Sonographic features include a well-demarcated anechoic lesion. Typically, internal motion or swirling of fluid with transducer pressure is not seen on ultrasound differentiating from abscess or hematoma. Lack of predominantly anechoic areas is another differentiating feature. Muscle biopsy has been done in some cases and shows coagulative necrosis of affected muscles with evidence of microvasculopathy and small vessel occlusion with fibrin thrombi. However, muscle biopsy is not necessary for diagnosis and is currently not recommended. Typical MRI findings obviate the need for biopsy in most cases. The pathophysiology of DMI is not clear. Although atheroembolism and local vascular atherosclerosis were initially postulated as probable mechanisms, it is now considered to be due to inflammation. It is possible that advanced glycation end products due to poor glycemic control leads to inflammation and, this in turn, activation of coagulation cascade. Local hypoperfusion results in edema and further compromise of microcirculation resulting in myonecrosis. Ischemia reperfusion injury may also contribute.,, Alterations in the coagulation-fibrinolysis pathway and increased levels of cardiolipin antibodies have also been reported in these patients. The treatment includes adequate analgesia and rest to the muscles involved. Rarely, compartmental syndrome may develop due to increased edema and fasciotomy may be required. Antiplatelet agents and low molecular weight heparin have been tried with variable success. Low-dose aspirin may shorten recovery time. Glycemic status should be adequately controlled. Although the short-term recovery is good, the condition carries poor long-term prognosis. The 1-year survival in some of the earlier series was as low as 55%. DMI is considered a myocardial infarction equivalent, indicating that they both have similar prognosis and suggesting a new tool for prognostic stratification of diabetic patients. The condition may recur in about 50% of the cases and carries a dismal prognosis. The condition must be differentiated from several other conditions which present with acute onset of limb pain in dialysis patients, such as fasciitis, focal myositis, abscess, and muscle hemorrhage. 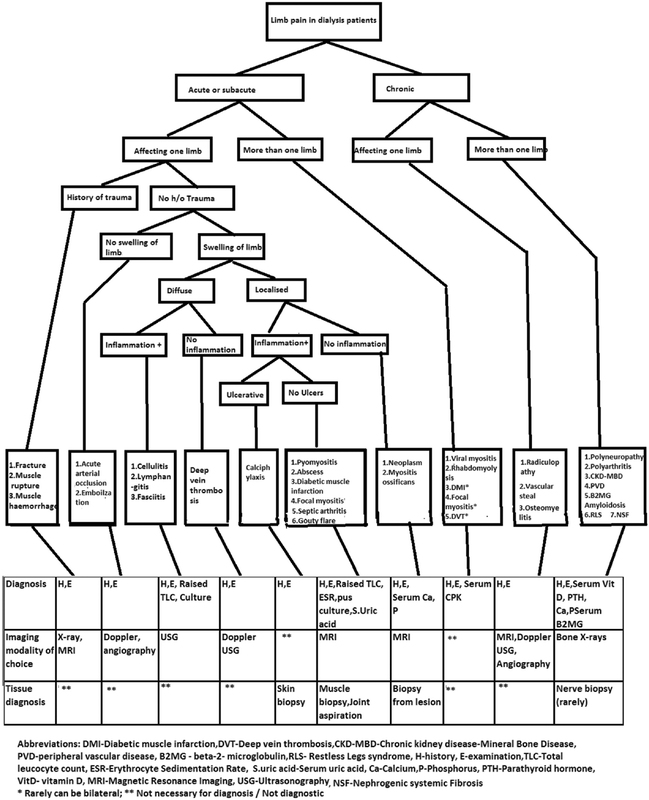 [Figure 3] depicts an algorithm for differentiation between such conditions. In conclusion, DMI is an uncommon microvascular complication seen in poorly controlled longstanding diabetes. Though self-limited, its occurrence carries grave long-term prognosis with high risk for early mortality. It is possibly under-recognized in CKD patients and should be considered in any patient with acute onset of localized pain in limbs. Chow KM, Szeto CC, Wong TY, Leung FK, Cheuk A, Li PK. Diabetic muscle infarction: myocardial infarct equivalent. Diabetes Care. 2002;25:1895. Trujillo-Santos AJ. Diabetic muscle infarction: An underdiagnosed complication of long-standing diabetes. Diabetes Care 2003;26:211-5. Lentine KL, Guest SS. Diabetic muscle infarction in end-stage renal disease. Nephrol Dial Transplant 2004;19:664-9. Huang BK, Monu JUV, Doumanian J. Diabetic myopathy: MRI patterns and current trends. AJR Am J Roentgenol 2010;195:198-204. Horton WB, Taylor JS, Ragland TJ, Subauste AR. Diabetic muscle infarction: A systematic review. BMJ Open Diabetes Res Care 2015;3:e000082. Yong TY, Khow KSF. Diabetic muscle infarction in end-stage renal disease: A scoping review on epidemiology, diagnosis and treatment. World J Nephrol 2018;7:58-64.